Former Liverpool star player Luis Suarez has backed his teammate Lionel Messi for the FIFA Ballon d'Or award. 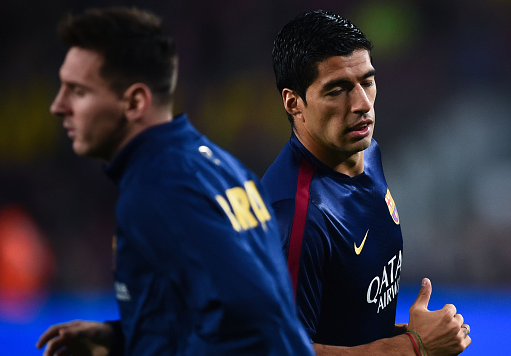 Lionel Messi has attracted Luis Suarez with his qualities in just few months. The Uruguayan moved to Barcelona in the summer and was banned for the start of the games. Despite of that Suarez has just fallen in his allure. Suarez told Spanish media outlet Mundo Deportivo that having the best player in their side gives them confidence on the field. Suarez admired the Argentinean by saying that despite of his struggling season in terms of injuries he did his duty of scoring goals and plus the big thing of taking his country in the finals of the World Cup in the summer. Messi has been incredible since he started playing football. Both the South American are of same age but Messi has scored goals double than Suarez. The Argentina international has recently made a record of scoring most goals in Champions League. This season, he has scored 20 goals in 19 games so far in all competitions. While Suarez who was not shortlisted in the initial list of 23-man for Ballon d'Or told that the selection criteria rankled him. Suarez bit Italy defender Giorgio Chiellini during the World Cup which banned him and cost him the place in the 23-man shortlist. The former Ajax star told that the officials judged him only on the World Cup performance. its ronaldo who will win!